‘Auchendarroch’ is Scottish Gaelic for ‘Holy Place of the Oaks’. 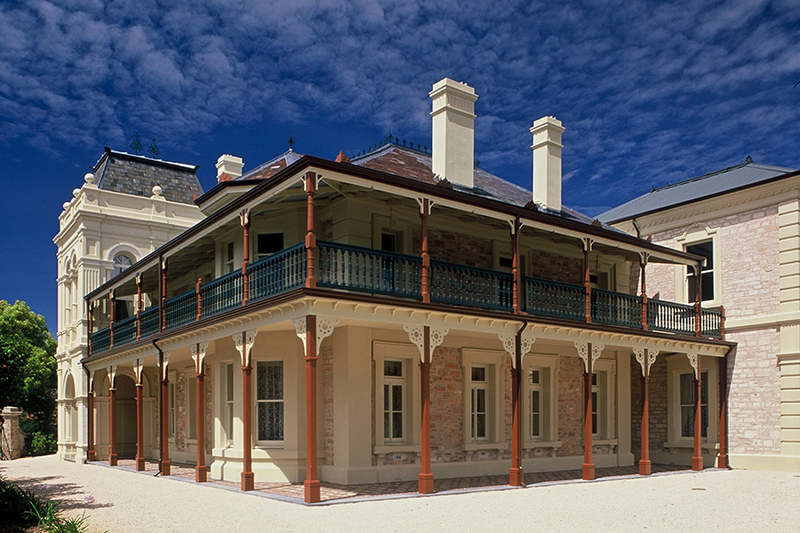 The heritage-listed mansion was so named by Robert Barr Smith and holds a significant place in South Australian history and in particular for the Mount Barker area as the summer residence of the Barr Smith family. The house was returned to its former glory through a meticulous restoration program that occurred during the construction phase of the adjoining tavern and cinema complex. The work included the delicate restoration of the original William Morris ‘Spring Thicket’ wallpaper, numerous ornate timber and stone fireplaces and the grand timber staircase. The exterior fabric was fully restored with specialist trades employed for the stonework, verandah mosaic tiles and timber verandah structures and balconies. Experiencing a new lease of life and renewed relevance within the local community and beyond, this grand old residence now serves as a restaurant and an elegant venue for weddings, conferences and other private functions.